I had some Gable Box die cuts in my bin and started playing with them - They're so cute and work well for cookies or small trinkets etc... but I said to myself would be great also stacked to make a larger box... and voila. I created the candle so made the box tall enough for it. 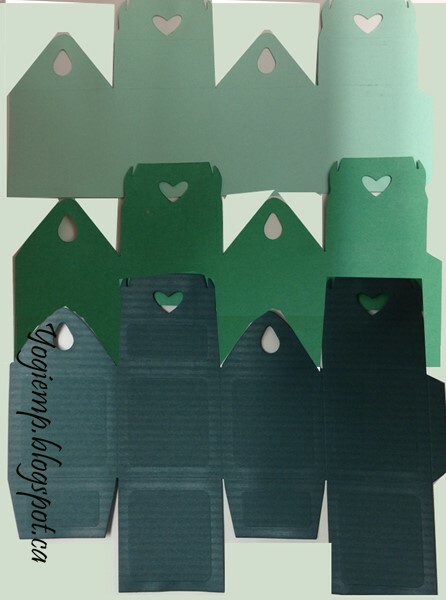 I used my extender plates on my Cuttlebug to first cut the complete die shape from a dark green textured cardstock. 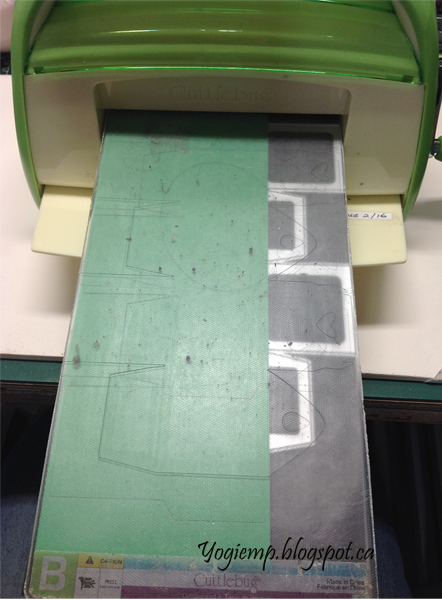 Then cut the medium green and light green layers, only cutting part of the die shape as shown in image above. Adhered the top flaps of each layer to the next layer. Then adhered to assemble into a box. Die cut the holly and pin/acorn sprigs from green scraps then hit the with Distress green. Adhered to box on the flap area where the hearts are as camouflage. Die cut the "Noel" from an Oriental Menu that was mailed to me. I was about to throw it out, but said to myself, it's a nice glossy heavy weight cardstock with really nice food images... I love the way the die cuts turned out. It was a 6page menu so have lots of die cuts BIG GRIN. The other two sides are repeated. For the Candle: I created the candle using a waffle sheet of cream toned bees wax tightly rolled around my wick. I then die cut the holly leaf and used it as a template to cut my green wax with an x-acto knife. Adhered to candle with a touch of heat from my heat gun. Added 3 little red berries. Die cut the tag and trimmed down to fit my box from a white lightly textured cardstock. Used my Tim's Stampin Platform and stamped the words using Versafine Black Onyx and clear embossed. I probably did this a little backwards... doing the background after the word stamping SIGH!!. Inked my craft mat with splotches of Distress pads "Candied Apple" and "Mowed Lawn", misted with water and smudge my tag through the wet colors. Be careful or you'll end up with "MUD..." since you are basically using 3 primary colors - green which is blue and yellow and the red. When dry applied quickie glue and sprinkled with red glitter in the "o" shapes.